In between quilting custom quilts, I try to always quilt a few allover type quilts. It is a nice break from the concentration it requires to get a custom quilt done. I love the creativity in custom quilting, but it can be mentally and physically exhausting. Doing a few allovers before starting my next custom job really helps to re-motivate and re-energize me. I had the pleasure to quilt a very inspirational quilt for Pam. She was gifting it to someone who had lost a loved one far too soon. The pattern is called Guiding Stars. In the white blocks, there are verses from the book of Psalms. Pam did a wonderful job on the piecing with all those points! The fabric is beautiful. I love how it turned out. The quilting added texture and movement without taking away from the quilt. A simple allover swirl fit the bill for the quilting. The thread is Vegas Gold from Glide, top and bobbin. Batting is Quilters Dream Cotton in the mid loft. Pretty back! What a beautiful gift. On a side note, I was contacted back in March by Vickie Gillespie, the Publisher and Editor-in-chief of Quilters' Digest to see if I was interested in submitting some of my work for publication. What a surprise!!! Of course I was!!!! 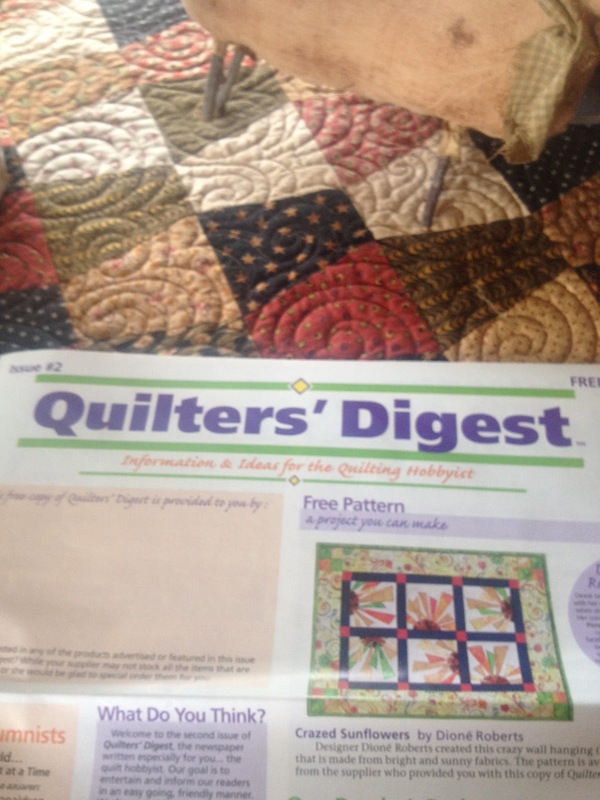 Quilters' Digest is an awesome publication that is available only at your local quilt shop...if they carry it. It is a quarterly publication. I highly recommend it!!! 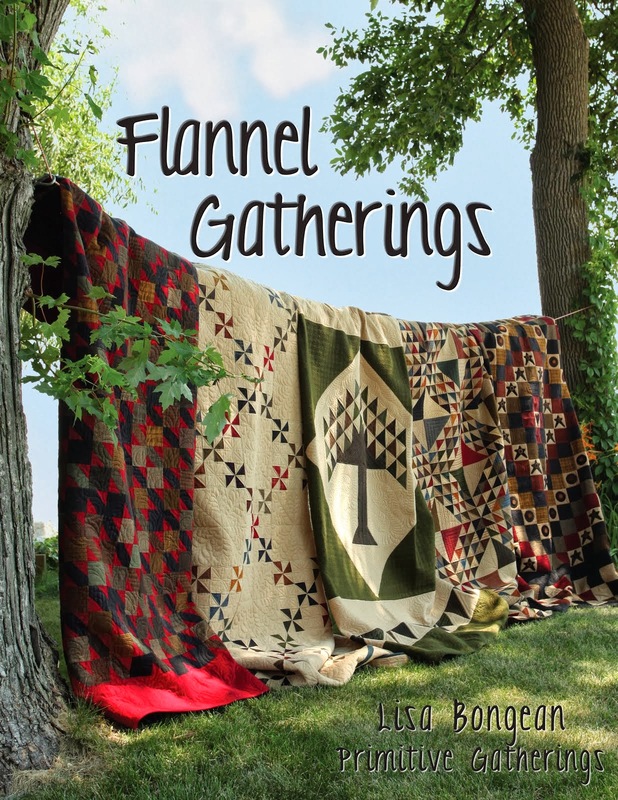 It is a wealth of quilting knowledge and tips!! I was a little busy this spring :-) and kind of forgot about it, so it was doubly exciting and surprising when Vickie kindly mailed me the latest issue!!! Featuring the quilt I quilted for Thelma of Cupcakes 'n' Daisies. Thelma's gorgeous Baby Swoon based on the pattern Swoon by Camille Roskelley. Super cool...super fun!!! 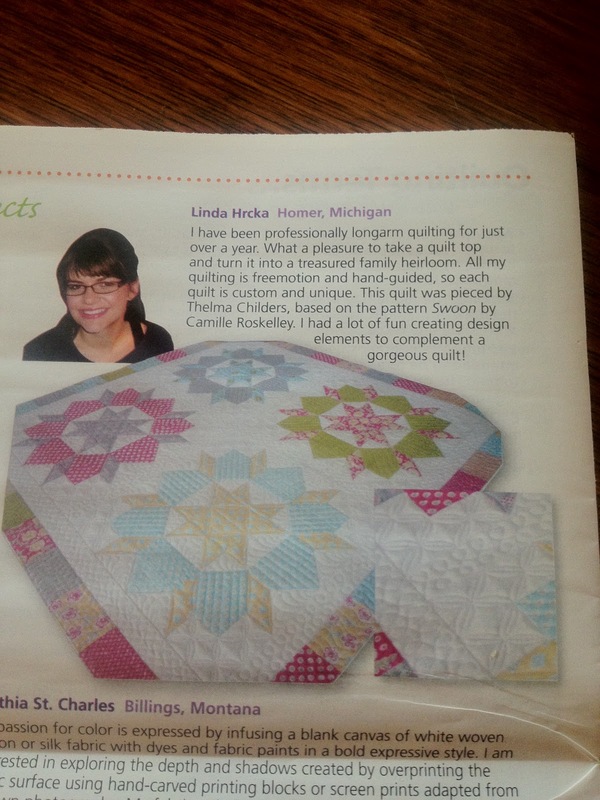 How fun to see your name and quilts in print!! Congratulations! What a treasure for Pam to remember a loved on -- beautiful, Linda! Congratulations on the article - how thrilling! I don't think I've ever seen this publication, but will sure keep my eye out for it now! Her quilt is beautiful and love how she did the verses like that, nice look and script. Congratulations on the magazine! Well you're just becoming quite the quilter celebrity! Congratulations to you!! The swirls on the Guiding Stars quilt is perfect. The recipient of that quilt will cherish it forever. Congratulations on being published! The quilting on the Baby Swoon, and on the Guiding Stars quilt are both lovely. Congrats on being published...that is wonderful!! The Guiding Star quilt came of beautifully...such a pretty topper and you did a wonderful job as usual!! See, I keep telling you how amazing you are! Maybe you'll start believing it! Congratulations! The Guiding Stars quilt is pretty amazing. Well done! 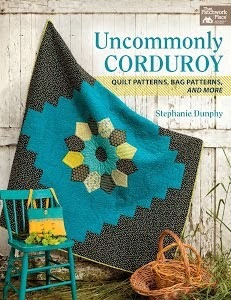 Congratulations on having your quilting published. You sure deserve it. Your work is just awesome! I knew you would be famous one day! Congrats. The Stars quilt is gorgeous! How fabulous to see your name in print - congratulations!